So what do I have up for a prize? Well, remember a few weeks ago when I was talking about how much I loved Symbolic Imports' Gingerbread perfume? It's delicious without smelling like a gigantic cookie. So, I got some roll on gingerbread perfume, some butter cream lip balm, some salted caramel lip balm, and a bar of pumpkin soap, all made by Angel from Symbolic Imports. And all these goodies will arrive tucked into a zipper cosmetic bag, made by myself. 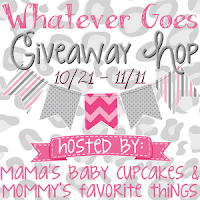 My giveaway is open world wide, so use the Rafflecopter giveaway to enter for your chance to win. 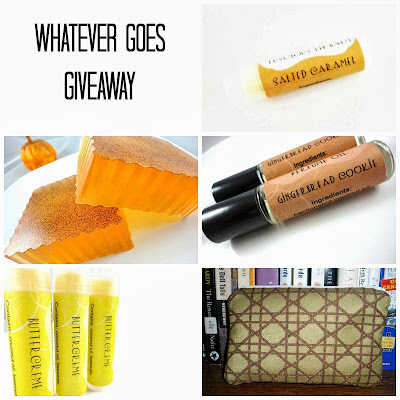 And then be sure to check out the links to everyone else's giveaway. And PS- if you don't want to wait for the giveaway to get your hands on some goodies from Symbolic Imports, check out their Etsy shop. My favorite food smell would be my mom's stuffed shells. Makes my mouth water just thinking about it! My favorite food smell is baked items, like sweets. Like when you walk into a bakery. Yum! That's a delicious smell for sure! My favorite is the smell of garlic and herbs like in most of our pasta and soup dishes. Ooh, I agree! I don't think I'd want a garlic and herbs scented candle or anything, but I love that smell when you're cooking. I have to agree with Karen F..baked goods are the best smelling things. Besides candles and incense of course. My very favorite food smell is chocolate cake baking, especially if I am not baking it myself. Symbolic Imports is fabulous shop. Angel is an excellent Etsy seller. Good luck everyone! Agreed! She's a great seller. I've always loved everything I've bought from her. It always smells awesome! My favorite food smell: pastry - a baking cherry or apple pie. I love the smell or real, true vanilla, but hate things that are fake vanilla scented, like some candles. Kind of the same with bananas- love to eat bananas but fake banana flavored stuff is nasty. My favorite food smell is pot roast cooking in the crock pot. My favorite is cinnamon candy- not really a "food" but it makes the house smell good for days. I love that smell! I like the way onions smell when they're cooking on top of the stove. vanilla and spice is my favorite food smell, like fresh baking! Ooh! That's a smell that makes my mouth water. my favorite food smell is the smell of freshly baked bread. Hmmm....it's between fresh bread and cinnamon. My favorite food smell is fresh baked bread. I'm taking the Craftsy Artisan Bread Making class and I think that pulling the baked loaves out of the oven is one of my favorite parts. They just smell so good! I love the smell of pumpkin pie! I like cucumber melon, vanilla, baked goods, cinnamon apple - so hard to pick a fav! Coffee! I even love opening the cupboard where we keep the coffee! Baked goods! Vanilla, sugar cookies, blueberry muffins! I like baking bread. I think it must be the yeast smell? I love the smell of popcorn but the worst smell is burnt popcorn. I like the smell of coffee. And fresh soup. chocolate chip cookies. altho i do agree with the person above me that coffee is good too. I love the smell of vanilla, sweet and refreshing,. My favorite food smell is fresh baked bread. I think theres nothing like that smell. Love the smell of bacon. My favorite smell is fresh baked cake!! Definitely lemon and other citrus smells. Vanilla Cupcakes! Thanks for the chance! My favorite food smell is cinnamon. I love the smell of bread and cinnamon..... ok I love cinnamon bread! I love the smell of chocolate chip cookies and brownies. Apple pie! Love the spice combination. For me it's a tie between coffee and pumpkin pie! Tough one but for me it is probably tied between cinnamon buns and bacon. I love the smell of fresh brewed coffee and anything vanilla. Oh man, probably buttered popcorn! I mean I love everything, making me salivate thinking about it? Hah! But yes popcorn! I love the smell of brownies baking. I love the smell of chicken frying...yummy...comfort food! I love the smell of hot apple cider. My favorite food smell is lemons. I like Chocolate Chip Cookies baking...... and the smell.... is so yummy.